Excellent long life – The specially combined rubber compound excellent in wear resistance is adopted, 60-80% longer life than the standard type can be expected. 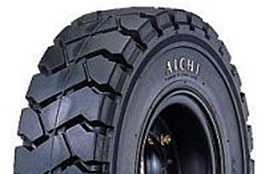 Soft riding – The new soft rubber is adopted inside to obtain the riding comfort and workability equal to that of the pneumatic tyre, which reduces the fatigue of an operator and also prevents the loss of work caused by collapse of the cargo piles by vibration. Efficient work – The rigidity of the tyre is acquired by increasing base rubber and strengthening side part to gives a forklift truck more stability for efficient work in corning and rising of the fork.